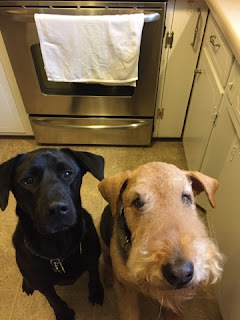 This started out as our diary of ownership by two rescued Airedale Terriers, Sophie and Murphy. Now we have added a Black Lab. 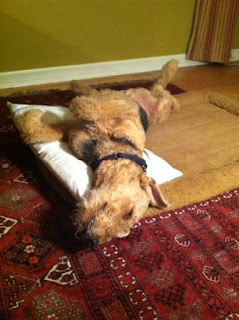 We hope that our stories will amuse and educate you about life with Airedale Terriers and others. Ian Murphy a.k.a " Big Wubba," " Mur-Mur," and "Sir Mur" was indeed an indispensable dog. He came to us from Airedale Terrier Rescue of the Virginias (ATRVA) in July, 2013 and immediately made himself at home. 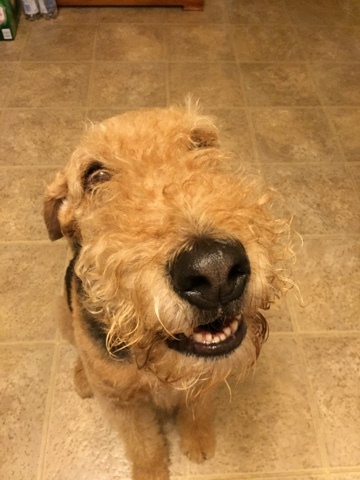 He was a great ambassador for his breed, making several home visits for ATRVA and giving his paw of approval to future Airedale “staff.” Wubba was all Airedale: nosy, bossy, loud, loving, obstinate and charming. No handbag or grocery bag was left unexplored, much to Mom’s chagrin during parties or book club nights at our house. 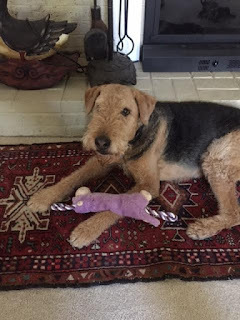 The rabbits and squirrels are breathing a sigh of relief as their routines are no longer interrupted by a large “hoovering” Airedale nose on their tails. We have noticed that the squirrels are running along the back fence “highway” again without disturbance. On occasion, they stop and listen for the sounds of that bossy bark that sent squirrels and rabbits scurrying for safety under the shed or way up in a tree. The opossum, in particular, are pleased with the current state of affairs as they too now have unimpeded passage along the back fence. Murphy loved surveying his kingdom from the back seat of the car and on the end of his leash. Car rides and daily neighborhood patrols were two duties he took seriously. Reading and depositing “pee mail” were important parts of his morning routine as was bush pooping. No bush was safe from being pooped on or plowed over in search of elusive prey. Murphy was a “hugger,” leaning into you for a back rub, if you were judged worthy of the task. Visitors to our home knew they were “in” when Murphy nosed through their bags and then leaned in for some love. He was partial to the Boy’s back massages and would position his back right in front of Boy and then lean back so that the Boy could comfortably reach his whole back. Mur Mur was a shameless beggar for love and would offer wilting looks of disdain, complete with a sigh, if the staff cut his back rub short. He ate on a schedule, but felt compelled to challenge it at every opportunity. Restless sighs, grumbling, standing in your path and pitiful looks of a starving Airedale generally started about an hour before feeding time. If the staff laughed at his antics, he became indignant and stomped away to briefly pout. After meals, a back flop and snoring generally indicated your job was done for the moment. His best rest was achieved lying on a bed pillow that he stole from the Boy while recuperating from knee surgery in 2014. He also enjoyed his flannel blanket on those cold winter nights, but only if his ears were left uncovered. He needed to have an ear on anything that might be going on! Sir Mur’s happy place was the beach. Last summer he learned to “snorkel” with Jerry’s help. He got his nose into the water and kept his eyes out so he could spy treasures that needed to be fished out. Murphy became a master of fishing for seaweed and his all-time favorite: dead and smelly horseshoe crabs. 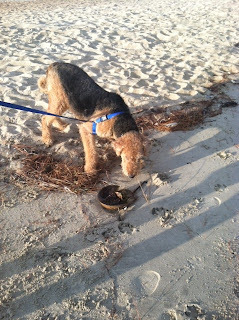 Nothing was better than attacking a dead horseshoe crab! 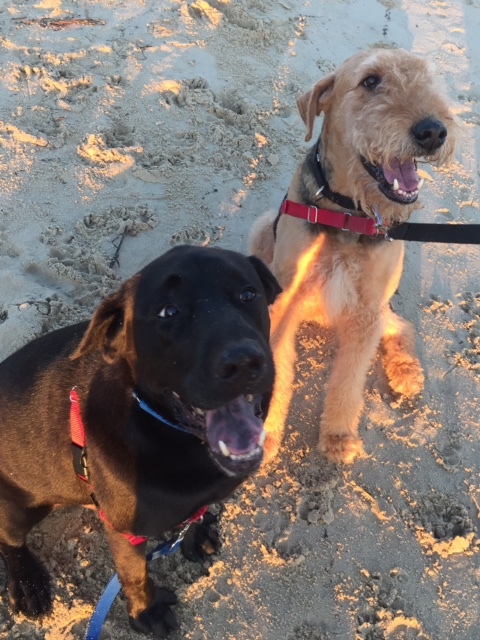 The more sand he carried off the beach in his fur, the better! He was a connoisseur of cheese, particularly sliced extra sharp cheddar and mozzarella cheese sticks. He could hear the cheese drawer in his sleep and would appear at your elbow from a sound sleep. Scrambled eggs and bacon were also delicacies not to be missed. Many weekend mornings, Mom fried bacon with Murphy’s nose stuck up in the air smelling the upcoming treat and a careful eye on Mom (just in case she kept all the bacon for herself). Murphy passed away peacefully on March 25, 2017 with his family surrounding him and the staff from his vet's office in support. It goes without saying that he is sorely missed by his family and Lab pal, Jerry. He will be interred under a tall tree in the back yard where many squirrels reside. Hampton Roads Dog Blog — A Dog's Guide to Living in the 757!